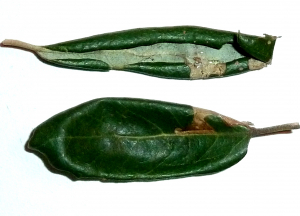 Observation - Leaf mine on cork oak - UK and Ireland. Description: One of many on a single tree. Red arrow shows exit hole in upper surface. Black arrow shows another hole (entrance or just an artefact?). B&W photo shows frass pattern (up to a point) and route of main gallery. One of many on a single tree. Red arrow shows exit hole in upper surface. Black arrow shows another hole (entrance or just an artefact?). B&W photo shows frass pattern (up to a point) and route of main gallery.